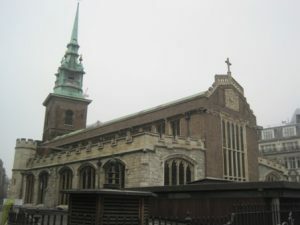 All Hallows by the Tower is an Anglican church and is the oldest church in the City of London having been founded in 675. The church overlooks the Tower of London and has been largely rebuilt, but Saxon details can be seen inside. Recent additions include a copper spire and the pulpit from a Wren church. In the crypt is a museum with Roman and Saxon relics and a Crusader altar. A cafe/restaurant has recently been opened by the church to raise funds. This is immediately to the east of the church and provides reasonably priced nutritious fare in competition with the surrounding tourist outlets.